A meteor exploded over Earth in December with ten times the force of the atomic bomb which decimated the city of Hiroshima in World War Two. It took place on 23:50 GMT on 18 December 2018 over the Bering Sea - between Russia and Alaska. It is believed to be the second largest meteor explosion in the last 30 years, and the biggest since the high-profile Chelyabinsk fireball of 2013. Meteor explosions are common but large events are rare, with ones this big only occurring a handful of times a century. It measures 30ft (ten metres) wide, weighed more than 1,500 tons and released the same amount of energy as 173 kilotons of TNT. Peter Brown at the University of Western Ontario, Canada, made the discovery and posted his findings on Twitter. 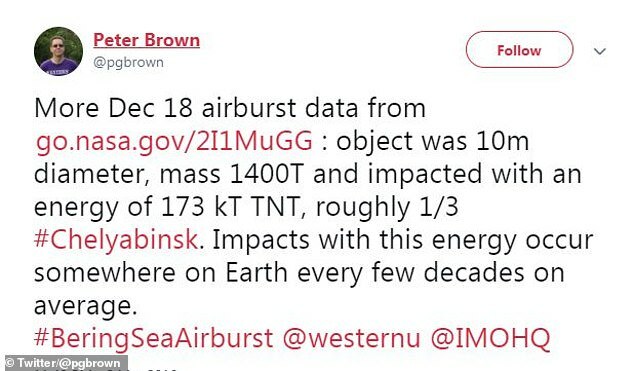 The explosion occurred around mid-day local time as the space rock barrelled towards Earth at a steep seven degrees and blew up 16miles (25.6km) above the surface. Kelly Fast, near-Earth objects observations programme manager at NASA, discussed the event at the 50th Lunar and Planetary Science Conference in The Woodlands, near Houston, Texas. 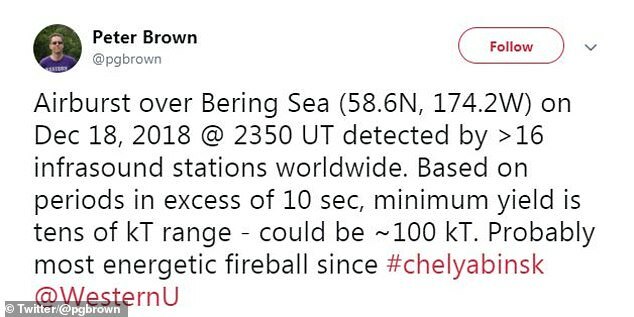 'That was 40 per cent the energy release of Chelyabinsk, but it was over the Bering Sea so it didn't have the same type of effect or show up in the news,' the BBC reports. It was detected by military satellites which automatically informed NASA, but scientists outside these organisations have only recently assessed the data. 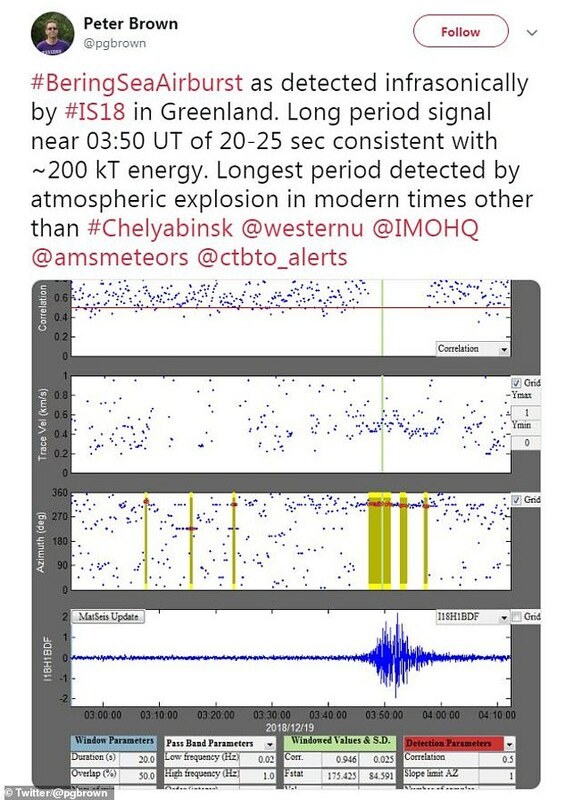 It is only outdone in size and intensity by the Chelyabinsk meteor which crashed into Russia in February was part of a 656-foot wide asteroid called 2011 EO40. NASA satellites made the unprecedented measurements of the meteor which is thought to have released 30 times more energy than the atomic bomb that destroyed Hiroshima. The meteorite broke up into multiple pieces as it entered the atmosphere, scattering space debris and creating a shock wave estimated to be as strong as 20 Hiroshima atomic bombs. The scale itself broke the moment it hit the 570-kilogram (1,255-pound) mark.